There are a few people that can be credited with influencing and growing Tango in the US, and Sharna Fabiano is one of them. Not only does Sharna have a profound understanding of Argentine Tango from years of experience and exploration but also an inquisitive mind bent on understanding tango’s deeper meaning and relevance. Sharna will be offering workshops here in the Bay Area this coming weekend, an appropriate time to learn more about her thoughts on Tango, Dance and Creativity. Sharna is a lifelong dancer with a background in ballet, contemporary technique, yoga, and improvisation. She discovered Tango in 1997 while working in Boston as a graphic designer. In the years that followed, she made six journeys to Buenos Aires. Both in Argentina and elsewhere, she studied authentic Argentine Tango improvisation from some of the greatest names in the modern Tango Renaissance. From 1998-2002, Sharna worked in Boston as a member of the innovative company Bridge to the Tango, founded by tango historian and revivalist Daniel Trenner. In 2003, Sharna joined the internationally acclaimed TangoMujer, the first all-woman tango company in the world. She created three original works of choreography, including a solo commissioned by the Auros Group for New Music. She performed with TangoMujer between 2003-2006 at Jacob’s Pillow Dance Festival and at theaters in NYC, DC, San Francisco, Berlin, Dusseldorf, and Hamburg, Germany. During these years, she also began teaching regularly in Europe. Re-locating to Washington, DC, she was invited to dance at the Argentine Embassy and contribute work to the Dance DC Festival, DC Improv Festival, and Hispanic Festival. Between 2006 and 2010, she created three evening-length performances at Dance Place, supported in part by the DC Commission on the Arts & Humanities. Her collaborative work, “Uno”, with composer Glover Gill, was selected for the Festival Cambalache in Buenos Aires, an international festival featuring artists blending the disciplines of tango, theater, and contemporary dance. Sharna currently lives in Los Angeles and teaches in the Departments of Theater and World Arts and Cultures/Dance at UCLA and at Oxygen Tango. Obviously, much has been written about Sharna, and she herself has done much writing on the topic of Tango. I decided to find out more about her Annual Women’s Tango Retreats, her experiences dancing with TangoMujer and her plans for the future now that she has an MFA in Dance from UCLA. SF Loves Tango: You co-host an annual Women’s Tango Retreat. Can you discuss your motivation for creating events for women only? Sharna: Looking back, I think it was my very early experiences with social tango that set the stage for my work with women. I was only 22 years old when I started, and I had that familiar experience that gets discussed a lot now on tango blogs, where the young beginner gals get asked to dance constantly by all the men while the more skilled and more mature women sit and watch. The community was quite small in 1997, so I felt this phenomenon very acutely, and I saw that it isolated me from the other women, and the whole situation really bothered me. I also was not at all comfortable with the attention I was getting simply for being young and female, but I didn’t know what to do about it. All I remember, now, is that it was extremely stressful to navigate that territory, and it was interfering with my creative enjoyment of the dancing. I might have dropped out, eventually, but then I had the great fortune to study with a series of teachers who advocated the dancing of both roles (Daniel Trenner, Brigitta Winkler, Nil Disco and Esse Dijks). In particular, seeing women dance together was mind-altering for me. I had studied contemporary dance in college and so, in that moment, it just sort of clicked in my head that tango was another form of Dance, with a capital D, and suddenly it seemed like the most natural thing in the world for me to learn both parts and to be able to dance with anyone, just as a contemporary dancer can perform a duet with anyone, change position, or learn someone else’s part. This re-orientation toward tango roles immediately connected me with other women in the community, because I could dance with them, and my doing that diminished a lot of the competitiveness that had been there before. That, I actually found kind of revelatory, and the women that I practiced leading with became my closest friends. Later as a professional instructor and organizer, I saw the same story repeating itself in countless variations, so based on my own experience, the response was pretty clear for me: make classes and workshops for women to learn to lead together. I would say it’s a kind of community building, and it helps to neutralize that competitive tendency that exists in social tango, especially when there are more women than men, which is often the case. There are millions of other reasons why leading is a good thing for women to do, but I’ll leave that for another article! SF Loves Tango: Can you talk about your experience with the all-woman company TangoMujer? Sharna: The women of TangoMujer were early role models for me. I still remember seeing a postcard of Rebecca Shulman and Brigitta Winkler, barefoot, turning around each other in some strange yet still tango-esque position, and I thought, “YES! These women are wild and crazy, this is the tango I need in my life!” It was such a sharp contrast from the broadway show Forever Tango, which I couldn’t relate to at all. So initially, I didn’t even know them personally, I was just insanely inspired by the existence of such a company. The fact that they were women was part of it, but even more than that was the way they were mixing genres of performance. It was tango, but also something else that I didn’t yet know how to describe. They danced solos, they danced quartets, they turned tango upside down and backwards. It was amazingly beautiful to me. 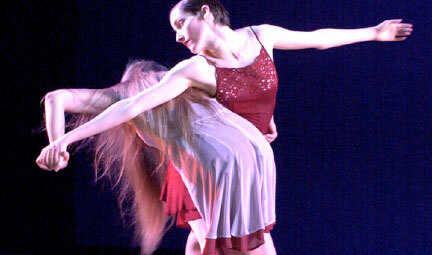 The company performed from 1996-2006, and I had the honor of collaborating with them for the last three of those years. I learned a lot, and made tons of mistakes. It was my first experience in a professional dance company, trudging through the endless blood, sweat and tears that it requires to get a show up on stage, and at the same time feeling so much urgency and excitement around doing it. Then there was the tremendous fear of messing up in front of all of these women I had looked up to for so long. And of course I messed up all the time. 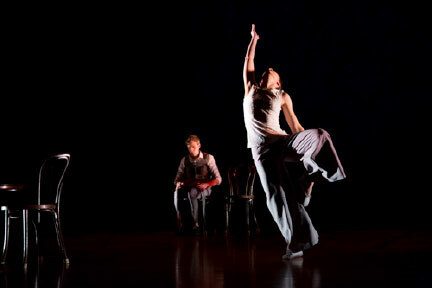 Somehow, though, I made a long piece with them that was very modern, influenced by my contemporary dance background. It was my first big departure from classical tango. Then I made a solo, and a more traditional tango duet, and I learned some of the repertory pieces that the others had made in previous years. All of that was super influential in the formation of my own choreographic identity. It’s always a little embarrassing though, for me to reflect on past work. I see where I was then and all that I didn’t know and I sort of cringe… But, if I hadn’t done that work, I wouldn’t be doing what I am doing now. That period of time set me on the path of becoming a choreographer. After TangoMujer, I ran my own company in DC for four years, and got accepted to graduate school in LA in 2011. SF Loves Tango: Can you share with us your own future goals in regard to dance and Tango? Sharna: Well, I think I am just now starting to figure that out. I was in graduate school from 2011-2014, which is kind of like being in a really uncomfortable cocoon. Post-degree, I’ve discovered that I enjoy teaching in a university setting – it’s a valuable and rare chance to discuss dance and movement not only as recreational activities, but as essential ways to know ourselves as human beings. And that feels really important to me, especially as the digital world expands. My choreographic work now tends to address what I see as the underlying themes of tango, ideas like partnership, isolation, and longing, but it doesn’t really LOOK like tango much at all in terms of its form or shape. Grad school forced me to do this. Do I really care that much about a boleo? Turns out, I don’t. I care more about the experience of loneliness. I care more about the desire for freedom. I care more about the inner demons who try to control everything, and about our deep impulses to change and transform. In tango, most of this is felt, not seen, so working directly with the themes themselves gives me a lot more freedom in how I choose to reveal them for an audience. And it makes collaborations with artists of different disciplines more intuitive, so I guess right now I feel curious to keep expanding the ways that I make choreography, and seeking out new collaborations. I think social tango at its best provides the feeling of connection and belonging, but it often delivers the opposite of that. There’s plenty of confusion and disappointment floating around, so as much as I can, I want to give my energy to projects and teaching opportunities that will be creative and uplifting, or at least give people tools to have more deliberate control over their own experience of social dancing.